Linda Bhreathnach, Sorcha Ní Chéide and Emma Eliza Regan who star in the short film Adulting by Linda Bhreathnach and Justin Davey. Photo:- Seán McCormack. 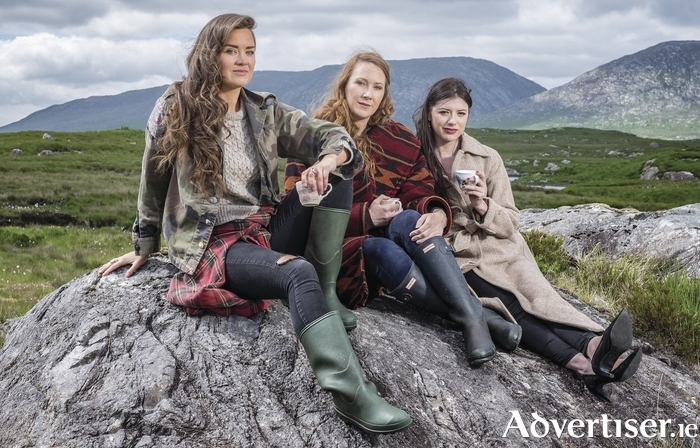 ADULTING, A new short film set in Galway city and Connemara, and featuring Galwegians Linda Bhreathnach, Sorcha Ní Chéide and Emma Eliza Regan, premieres at the Galway Film Fleadh. Adulting finds Jane in the middle of a crisis and she doesn’t want to talk about it. Made by Linda Bhreathnach and Justin Davey, it will be shown as part of the Galway Film Fleadh's New Irish Short Film strand in the Town Hall Theatre on Thursday July 7 from 12.30pm. Originally from Rosmuc in Connemara, Linda wanted to create a film "that speaks for my generation and shows the West in a way that’s not twee or clichéd". Written by and starring Linda (Corp agus Anam, The Running Mate ), it also features Carrie Crowley (Vikings, Fair City ), Paraic Breathnach (Jack Taylor, Breakfast on Pluto ), Emma Eliza Regan (Jack Taylor, Darkness On The Edge Of Town ), Sean T Ó Meallaigh (Vikings, An Klondike ), and James Riordan (Lipsinkers ). Writer Ferdia MacAnna has called the film "quirky, insightful and unique".